New - Inner Seals Intact Wyse 5000 5012-D10D Desktop Slimline Thin Client - AMD G-Series T48E Dual-core (2 Core) 1.40 GHz - 2 GB RAM DDR3 SDRAM - 8 GB Flash - AMD Radeon HD 6250 - Gigabit Ethernet - Wyse Thin OS - DisplayPort - DVI - Network (RJ-45) - 4 Total USB Port(s) - 4 USB. Box has been opened/might be distressed. Wyse 5000 Series Thin Client. Thin client for virtual desktop environments also serves as a powerful yet compact cloud desktop. The Wyse 5000 series thin client is a highly efficient and powerful endpoint platform for Citrix®, Microsoft®, VMware®, and Wyse vWorkspace virtual desktop environments. It is available as a zero client, a diskless cloud desktop or a thin client with Windows Embedded Standard®, Wyse-enhanced enterprise Linux, or virus-immune Wyse ThinOS. With its extremely compact size and high performance, it's a versatile virtual desktop endpoint or cloud desktop when used with Wyse WSM software. Need to deploy a dependable platform to display, manipulate and work with high-definition multimedia, voice and video in a virtualized environment? With a choice of powerful, energy-saving dual or quad core AMD G Series APUs in a compact chassis with dual-HD monitor support, the 5000 series thin client delivers stunning performance and display capabilities across 2D, 3D and HD video applications. As such, it supports a broad and diverse range of user, application and operating requirements. Highly scalable, easy to operate and manage. IT administrators won't need to visit or touch cloud clients to manage them. The 5000 series thin client can be managed remotely with Wyse Device Manager (WDM). WDM lowers the total cost of ownership for large deployments and offers remote enterprise-wide management that scales as you grow from just a few to tens of thousands of cloud clients. Environmentally conscious computing without compromise. When it comes to energy efficiency, the 5000 series outperforms other, more power-hungry desktop alternatives. Its silent diskless and fanless design helps reduce power usage to just a fraction of that used in traditional desktops. Dell is committed to helping you implement a computing strategy with a lower environmental impact - one that offers an efficient and productive computing experience by significantly reducing energy usage and heat generation. 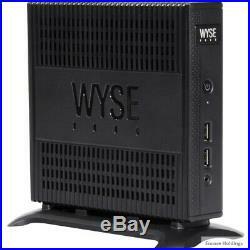 Wyse 5000 5012-D10D Thin Client. Total Number of USB Ports. Number of USB 2.0 Ports. SaveCentral operates this outlet store. We do not mark merchandise values below value or mark items as "gifts" as US and International government regulations prohibit such behavior. Removing the product from the United States will void all warranties/guarantees. If there does happen to be an issue, we will work with you to make it right! Please contact our Customer Service team. And we'll make it right! The item "909834-04L Wyse 5000 5012-D10D Desktop Slimline Thin Client AMD G-Series T48E" is in sale since Friday, March 22, 2019. This item is in the category "Computers/Tablets & Networking\Enterprise Networking, Servers\Servers, Clients & Terminals\Thin Clients". The seller is "savecentral-outlet" and is located in Colorado Springs, Colorado.